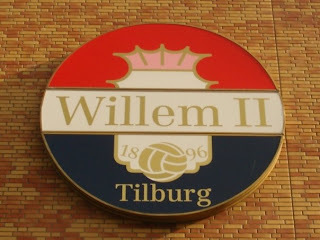 The last day of the EFW Oktoberfest and finally our hosts in Tilburg (Willem II) were playing at home. It was with a heavy heart that we checked out of the 1 FIFA star rated 'Hotel Central Tilburg' on the morning of the match. That was one place we'd all grown very fond of. Iain Ferguson best summed up the shower situation when he said "I turned on the hot tap which was too hot, then I switched on the cold and the tap came off in my hand." 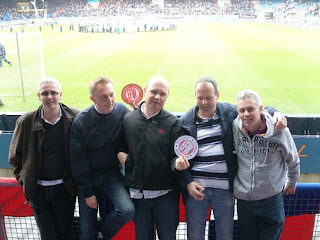 There looked to be a few casualties within the EFW team as we met up to head to the Koning Willem II Stadion. A few of the German boys had been in the Grass Factory for some morning Dutch treats and the previous nights marathon drinking session looked to have taken its toll on some of the older lads. Not to fear though, as soon as we stepped into the superb bar inside the stadium and set about tackling a battleships worth of Jupiler lager, the colour returned to our collective cheeks. In return for providing us with the weekend funnies, I taught Hans from Antwerp and the youngest of the FGR Pearchy's (Rich) how to dance. Hans and Richy Pearch polish their new dancing skills. Willem II and EFW have a common enemy, namely, NAC Breda. They are the biggest rivals of the King's Army and didn't endure themselves to us either by becoming the most difficult club we've ever had to deal with. Compare that to the delightful Kim Dijkstra in the Willem II ticket office who not only welcomed us with open arms but gave us a discount on our match tickets. 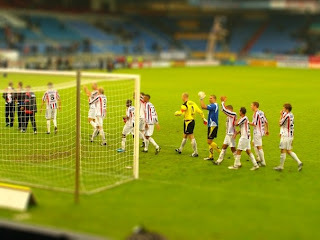 Willem II 1-0 NAC Breda. I know who we've nailed our 'Tricolores' to! My good friend Joris from the Doingthe116 website had arranged for EFW to feature in the club's Kingzine (fanzine). A double page spread I'll have you know and I thought I'd ticked the no publicity box (yeah, as if - Ed). With that feature in the bag and with this being the last day, the EFW team decided we'd go out with a bang, sing a few songs and P-A-R-T-Y. Double page spread in the Kingzine. Greetings from Antwerp - Hans, Pieter, Danny, Steven and Pat. However, the two teams trotted out onto the pitch in an eerie silence. As play got underway - aside from a ticker tape reception - there was no show of support amongst the home faithful. This was fairly frustrating because we had 30 odd lads behind the goal wanting to swing a fast shoe and sing a few ditties. What had happened!? News then reached us that the home fans had organised this period of silence in a protest against the club's chairman. He'd led Willem II from a Champions League place in 1999 to near financial ruin. Evidently, he'd blown the budget on a plush new stand with marvellous behind the scenes facilities which aren't of too much interest or help to the common fan. Word on the street was that if Willem II had of lost this match, there might have been some unsavoury incidents afterwards. The atmosphere must have manifested itself onto the pitch. I think the politest way to describe the first half would be 'cagey'. It was in actual fact pretty turgid. The only thing to save us from plucking our feathers out in boredom was a Gordon Banksesque save from Aerts the Willem II keeper to deny Heerenveen the opener. Ticker tape but muted welcome. Heerenveen striker in not deadly from a yard shock (he missed). FGR lads Keith, Andy, Shep, Witty & Rich. Nobody in the ground could have foreseen what was to happen in the 2nd half. With the protest over, noise (and lots of it) replaced the silence. With the fans behind them, the home side started to tear their opponents to shreds. Sergio Zijler was the main instigator alongside the on loan Jan-Arie van der Heijden. Hereenveen collapsed and their players plus 40 supporters had no answer, as eventually, it began to rain goals. By now the beers were flowing in the stands and the Pearchy (chuckle) brothers from Forest Green Rovers had upped their gags to one a minute. As if by magic, a delightful rainbow over the old skool floodlights also appeared. We got our party in the end. Goals from Zijler, Boutahar and a brace from Demouge sealed an emphatic second half performance. Papadopulos did reply for Hereenveen but that was all they had to offer in terms of resistance. 4-1. Is that all you take away? On the pitch!? Maybe not this time eh! And so the curtain came down on the inaugural EFW Oktoberfest. Four games, three days, two countries, thirty three people, thirteen goals, forty seven beers each, four sausages, sixteen Dutch meatballs and ten hours sleep. Never could I have wished for a better start to what could now become an annual event. Hungary for more next year? Then Budapest it is. That my friends was entertainment. Still want more? Then head to the European Football Weekends Facebook Group. A marvellous trip full of laughs, goals and beer....Looks like we will be busy trying to top that one next year in Budapest! Excellent series, Danny. But looks like Richey needs a few more dancing lessons. Cheers lads! Next years trip will be a hard act to follow but I have some good vibes about it already. Dave - it was murder on the dancefloor with those lads! 3)Me getting run over by a dutch cyclist ! and him ending up out cold. Well, it's all been said already (though not by everyone yet). It's been a perfect weekend, meticulously organised, great fun, and all made possible by the top people who've joined. My one regret from the weekend was that I didn't see the Pearchy/Dutch cyclist incident. Thanks for your mail and mentioning me. It's very funny and nice to read your report and get an idea how you lived this day. Maybe we'll see you and your friends again next season!